"Over 25 years together, 23 of those being married, my wife and I have been though a lot together. We've have ups and downs like every couples do. We've had personal losses, like the loss of loved ones at young ages but have had great triumphs, like our kids being born and them growing into responsible adults. With the latter being said, we took a look at ourselves and realized that we were not in any way heathy. My legs and knees were hurting so bad that I could hardly walk at times. My blood pressure was so high that Red Cross wouldn't even allow me to donate blood. Marilyn was not happy with how she looked and how she felt tired all the time. Since our late 20's and early 30's we have been struggling with our weight. As teens we were both healthy and thin, but over the years, bad eating habits and lack of exercise was starting to show. I put on weight, getting up to 394 pounds at my heaviest in early 2014. Up from around 180 pounds in my mid 20's. Marilyn had also put on weight, getting over 200 pounds at one point. With her only being 5' tall this took a huge toll on her well-being, mentally and physically. 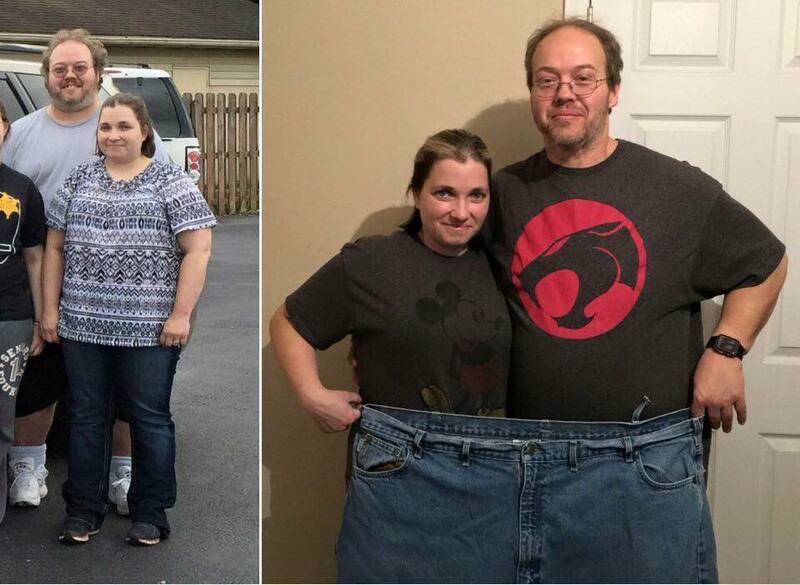 We had lost weight before, my wife was more successful than I was because, I lost 30 pounds, plateaued and gave up. Marilyn went on to lose 70 pounds. Unfortunately she gained it back and then some. She did not have the support she needed after I gave up. On June 10, 2015 after having bad pains in my leg and knees, I'd finally had enough. I had a doctor's appointment and that was when we committed to living healthier. I got on medication for high blood pressure and made a commitment to eat healthier and walk every day. Our first walk together was once around the block, and I thought I doing awesome in accomplishing that. Now we walk at least twice a day. We even started playing WallyBall, which is an absolute blast. This time we've lost over 221 pounds, 171.9 for me and 50 for Marilyn. We are now unbound by the limits of our bodies, and have lots of activities planned for this year and beyond. (The pants we are holding up are mine from last June)"